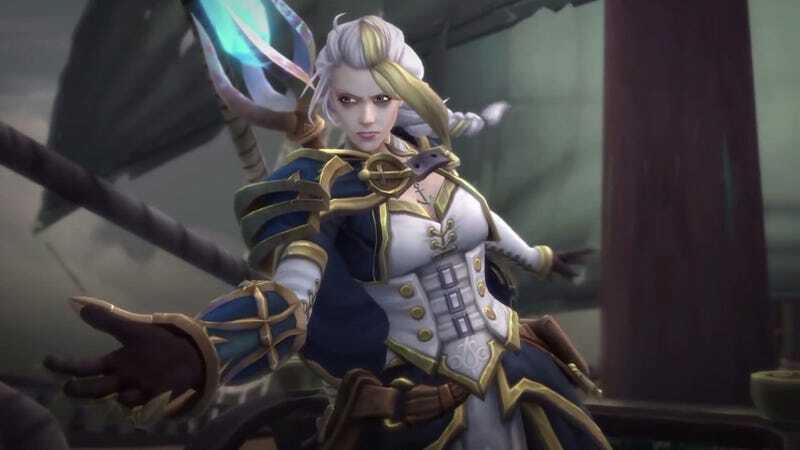 Earlier this week, top World of Warcraft guild Method defeated the Mythic difficulty version of the game’s newest raid boss, Jaina Proudmoore, who became available to fight on January 29. Yes, the Jaina Proudmoore, an Alliance leader you’re probably familiar with even if you haven’t touched Warcraft since it became an MMO. It took Method 347 tries. And then they did it again. Interestingly, to partially counteract this, Method ended up switching their characters’ races—which costs $25 per character—to trolls in order to get a racial ability that reduces the duration of movement-impairing effects by 20 percent. Jaina’s relationship with the Horde soured over the years, shattering entirely when Garrosh Hellscream assumed power and—among other heinous acts—bombed Jaina’s home isle of Theramore into oblivion. Since then, she’s oscillated between skepticism and outright hostility toward the Horde, and the recent atrocities committed by Horde mega-heel Sylvanas Windrunner haven’t exactly helped. The Battle for Dazar’alor raid, then, sees Horde players facing off with Jaina after an Alliance assault on the troll city of Dazar’alor. Alliance players are transformed into Horde characters for the purposes of making the whole thing make sense.